Hotel Mount Everest that in its hey day had hosted Mohammed Ali Jinnah and Amitabh Bachchan will soon be dismantled and a housing complex and a new hotel will come up in its place. East India Hotels (EIH) Limited, which owns the Oberoi and Trident brand of hotels, has announced that it has sold the property to a consortium of businessmen led by B.M. Garg, a Darjeeling-based multiplex owner, for Rs 11 crore. Garg said they had not yet finalised the details of the housing complex and the hotel that would come up. “We have not yet given any name to our business consortium or to the project. We will soon hire an architect to work out the details of the housing complex — given its demand in Darjeeling — and a high-end modern hotel. The land on which the hotel stands now and two residential buildings near it — Rutland House and Newstead House — were owned by Darjeeling resident Nemy Chandra Bose. The property, which stands on a plot measuring around 5 acres, is along Gandhi Road.The stretch was earlier known as Auckland Road. It is hardly a kilometre away from Chowrasta and is close to the Circuit House. Bose leased out the property to Arathon Stephen for 99 years, which was to end on December 31, 2013. Stephen turned the property into a hotel and named it Hotel Mount Everest. In 1925, Stephen transferred the hotel to Everest Hotels Limited. In 1963, it was transferred to a firm called Hotel 1938 Private Limited. In September 9, 1968, the property was transferred to East India Hotels Limited. According to author Sanjay Biswas, who wrote the book Pahar Theke Hariye Jaowa Padachinhaguli, Jinnah had stayed at Hotel Mount Everest in 1917. Actors like Dev Anand, Raj Kapoor, Sunil Dutt, Rajesh Khanna and Rekha had also stayed at the hotel. 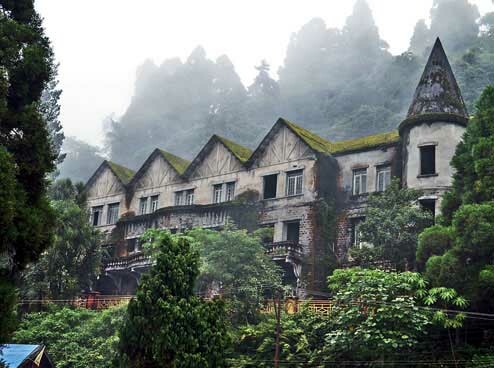 Periwal was one of the first residents of Darjeeling to hold his marriage reception at Hotel Mount Everest. “The hotel was devastated by a fire on October 19, 1978, and my marriage was on November 22, 1978. The hotel authorities ensured that the reception was held there. They closed down a section of the hotel with 30 rooms and opened the remaining 40 rooms for the marriage,” Periwal said. Hotel Mount Everest was finally shut in June 1984. Periwal said in 1969, a double room in the hotel would cost Rs 115 a day, while a single room came for Rs 85. Today, Garg said they were hopeful that they would be able to start the construction soon.